There has been a long fight between the proponents of Active Asset-Management versus Passive Investing via Index-products like ETFs. The main argument for the latter may be the low expenses versus the high Total-expenses which might occur if one buys an actively managed Investment-fund. Important to know: Most Investment-Funds compare their (yearly) performance against the S&P 500 - sometimes even without taking the Dividends into account (S&P 500 versus S&P 500 Total Return). Of course there are other Indices, which you could use in order to see if your fund (-management) did a good job or an average-job. If you look at the S&P 400 Mid-Cap Index or the S&P 600 Small-Cap Index, the S&P 500 cleary UNDERPERFORMED these 2 indices. But then again, several investment-funds even underperformed the S&P 500 (Reminder: this article only concentrates on Stock Mutual Funds)! What could this mean for the average investor? 1) You should somehow know, what you are buying! For a mediocre result the fees should definitelly be low. But do you really know how good your Investment Fund (-Manager) is? Does he know, what he is doing? 3) Taking the mentioned points 1 and 2 together one can conclude that the average investor also has to invest his own TIME, RESEARCH, getting involved in discussions, etc. UPFRONT/BEFORE making his investment-decisions for the next 3, 5, 10, 20 years, etc.! Further discussion on "Active vs. Passive Investing": Which Approach Offers Better Returns? ♦ "Success in investing doesn’t correlate with IQ once you’re above the level of 25." ♦ "If you are in the investment business and have an IQ of 150, sell 30 points to someone else." And yet Buffett also says most people should steer clear of active investing: He recommends low-cost index funds. 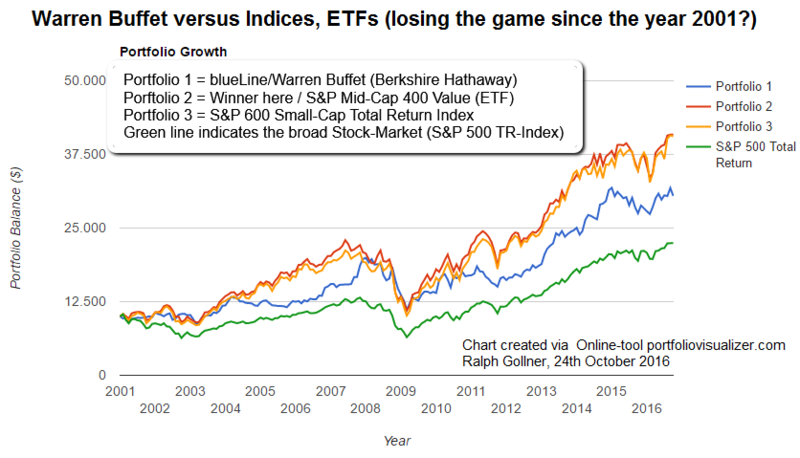 "A low-cost index fund is the most sensible equity investment for the great majority of investors" (words of W. Buffet). The opposite view is sometimes described as the "suckers at the poker table" hypothesis - the theory that an increase in passive investing is bad for active investors like Buffett because the fewer suckers there are to fleece, the less profit there is for smart active investors. Well, let us take a quick look at the near past: Morningstar named a recent occurance in the market "flowmageddon", writing in its newsletter that "something big is happening" to the investment management industry: "ETFs have gained the upper hand in the active/passive debate". The trend has been under way for years but the continued -and worsening- ability of asset managers to consistently beat their indices is expected to accelerate the move. Just 19 per cent of US mutual funds that invest in "large-cap" companies outperformed the S&P 500 in the first three months of 2016, according to Bank of America Merrill Lynch, the lowest quarterly hit rate since its data began in 1998 ! Only 6 per cent of "growth" funds managed to beat their index, the worst rate since at least 1991 (Status: March 2016). Tim Guinness, chief investment officer of Guinness Asset Manager and manager of the Guinness Global Money Managers Fund, commented, that the result could be "paymageddon" for active managers, he said. "We see ETFs and passives taking market share for a few more years, and in due course I would expect active funds to get cheaper and cheaper to compete. The days of great prosperity for active fund management may be behind us." Investment group executives are aware of the dangers and are scrambling to respond by cutting fees and unveiling their own passive investment vehicles. "This isn't a potential threat to mutual funds, it is already here," Joe Sullivan, chief executive of Legg Mason, told the Financial Times earlier this year. Over a recent 10-year period, active mutual fund managers' returns trailed passive funds consistently, says Kent Smetters, professor of business economics at Wharton. On an after-tax basis, managers of stock funds for large- and mid-sized companies produced lower returns than their index-style competitors 97% of the time, while managers of small-cap stocks trailed 77% of the time. Most experts and experienced investors know the reason: It's just too hard for an asset manager to pick a portfolio that outperforms the market by enough to make up for the 1, 2 or 3% fee that must be charged to support the stock and bond picking operation. Many index-style mutual funds and exchange-traded funds charge less than 0.2%, some less than 0.1%, giving them a huge cost advantage. My conclusion: Times are changing - the days of "High Fees for unjustified/low performance" might be coming to an end.